Dr. Sarah Bergbreiter is an Associate Professor in the Department of Mechanical Engineering with a joint appointment in the Institute for Systems Research at the University of Maryland. She received her B.S.E. degree in electrical engineering from Princeton University and was awarded her M.S. and Ph.D degrees in electrical engineering from the University of California at Berkeley where she focused on microrobotics. Sarah has been the recipient of multiple awards for her outstanding work including the DARPA Young Faculty Award, an NSF CAREER Award, the Presidential Early Career Award for Scientists and Engineers, and Sarah gave a TED Talk in 2015. Sarah joins us for an interview to discuss her life and work. Spending time with her family is a big part of Sarah’s life outside of work. Her kids are two and four years old, and they enjoy swimming, playing with legos, and building things. Sarah also spends her free time swimming and playing water polo. Sarah’s research involves building and conducting experiments with tiny locomoting robots that are about the size of ants. They also apply the same technologies used in their tiny robots to build better sensors and actuators for bigger robots to help improve performance of these robots. With a computer programmer mother and a scientist father, Sarah was exposed to technical and academic topics early in life. She remembers her mother teaching her how to type and use early spreadsheet programs when she was a kid. Sarah’s parents got her involved in science and engineering summer programs and encouraged her interests. She became fascinated with robots through movies and books, and she even tried to design a robot to clean her room when she was eight years old. In high school, there was a particularly memorable chemistry lab where they were studying the triple point where a substance can simultaneously exist in gas, solid, and liquid state. This involved putting a piece of dry ice into a plastic pipette and pinching it closed to increase the pressure. There were a lot of exploding pipettes involved, but it was a fun experiment. In college, Sarah was torn between pursuing history or engineering. After her first engineering classes though, Sarah was hooked. Writing her Ph.D. dissertation was one of the biggest challenges for Sarah. She tried various strategies to get the writing done, but it took a major shift in her perspective to make progress. In addition to the writing, Sarah had some challenges with the experiments in her Ph.D. work. Her project involved making small rubber bands and assembling them onto tiny silicon hooks. The challenge working with rubber was that it builds up a charge when it drags against surfaces and then it sticks to surfaces (think about the static charge created when you rub a balloon in your hair). To address this issue, Sarah had to buy a small amount of the element polonium to discharge the rubber bands to complete the assembly. Because polonium is a highly radioactive material, Sarah had to go through a lot of red tape to get the tiny amount she needed. Any time a student in her lab graduates and goes on to do something great, it is a rewarding success for Sarah. She also gets excited when a research proposal is funded, especially if it involves a new collaboration and an opportunity to explore a new area. Sarah and her collaborators at Northwestern University recently had a proposal funded to study rat whiskers. This is a cool project that will involve building models of whiskers that they can run through experiments to understand what is going on in rat brains when their whiskers are exposed to different scenarios. The prospect of equipping robots with whiskers is interesting because it would allow them to feel their way around an environment, even if there is not enough light for them to “see”. Sarah’s favorite conference was the first conference she attended as a graduate student. It was a microsystems conference that meets every two years in Hilton Head, South Carolina. The conference is relatively relaxed and laid back with designated break periods in the afternoons where you can go to the beach, network, and play volleyball with colleagues. The location is phenomenal and the attendees are amazing. Everyone was really open to talking about their research, and Sarah returned to the lab afterwards invigorated and ready to test out many cool new ideas. In Sarah’s lab, they have an annual holiday party with a white elephant gift exchange. People go to great lengths with packaging to make their gifts look desirable, and they have brought some really entertaining gifts over the years. One year, there was a large, heavy box that everyone had their eyes on. The recipient was surprised to discover two big sacks of potatoes upon unwrapping. There have also been a lot of neat robot toys gifted, and some of these end up going home with Sarah’s kids. It’s important to take a full day each week to do something different, especially when you are in graduate school. Take a break and do something else you like to do. Also, don’t be siloed by the traditional boundaries between science and engineering disciplines. Be open-minded and look outside your area because faculty and labs in other disciplines can benefit greatly from the skills and enthusiasm that someone from another field can offer. Sarah’s research is focused on the challenges of engineering robotic systems down to sub-millimeter size scales. Her group works both on small mobile robots (robotic insects for defense and disaster search scenarios), as well as microfabrication in support of larger robotic systems (tactile sensing or medical robotics for example). These goals result in compelling research in a number of supporting areas such as micromechanisms, microfabrication, microactuators, locomotion, sensing, control, power, and integration. Within her lab, there are ongoing projects investigating locomotion in mini robots where they are studying how mechanisms, gait, and sensing can improve the efficiency and effectiveness of travel in standard environments. Sarah has also been conducting research on jumping microrobots where nonporous silicon is used to provide the thrust to allow these devices to jump. Another line of Sarah’s research is focused on developing materials with tactile feedback capabilities. These active skins can provide high spatial resolution tactile sensors along with embedded silicon for low-level processing. 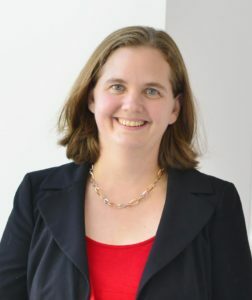 She currently serves on DARPA’s Microsystems Exploratory Council and as an associate editor for IEEE Transactions on Robotics and ASME Journal on Mechanisms and Robotics. Most importantly, she is mother to Kate (4 years old) and Julia (2 years old).